This journey through Cambodia and Vietnam will uncover magical moments in places you least expect. 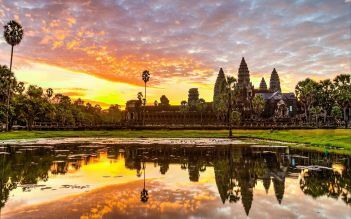 Gain insights into the region’s past in Phnom Penh and grasp the enormous splendor Indochina has to offer as you witness the sun rising over magnificent Angkor Wat. Explore Vietnam from the streets of bustling Hanoi and Saigon, to the charm of Hoi An, Hue and the historic Cu Chi tunnels, and a picture-perfect scenic cruise of Halong Bay on this unforgettable journey. On arrival in Phnom Penh, transfer to your hotel. Get to know your traveling companions and tour leader at welcome drinks and briefing. 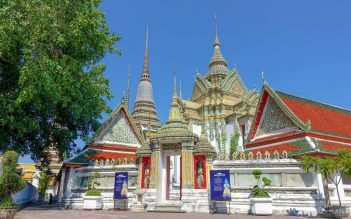 Discover Phnom Penh’s rich French colonial past from the unique front-seat perspective of a traditional cyclo ride and explore its majestic Royal character at the Royal Palace and the ornate Silver Pagoda. The National Museum offers a fascinating look at Cambodia's history with art and artifacts dating back to prehistoric times. Reflect on the Khmer Rouge legacy at Tuol Sleng and the Killing Fields and gain fascinating insights into Cambodia's confronting past. End your day at the Central Market observing the lives of the locals. A short flight brings you to Siem Reap, the gateway to the incredible temples of Angkor. On arrival, check into your hotel and enjoy the rest of the day at leisure. Early the next day, creep through the jungle with your path illuminated only by torchlight, and enter the little-used eastern gate of Angkor Wat to watch the sun's first light shining down on the magnificent temple - an experience you will never forget. Then, enjoy a local breakfast at an Angkor café. 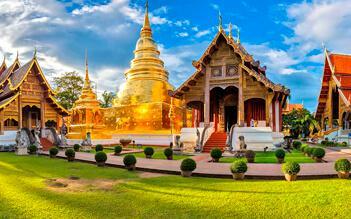 Travel between temples by tuk-tuk, ideal for taking photos. 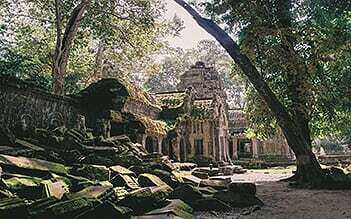 See the magnificent stone heads of Bayon before you explore the atmospheric ruins of tree-covered Ta Prohm. Share your experience with your fellow travelers at a group dinner. Fly to Saigon. On arrival transfer to your hotel. Bond with your small group of fellow travelers and tour leader at a tour briefing and welcome drinks. Gain insight into the resilience of the Vietnamese people as you investigate the amazing Cu Chi tunnels before wandering along the city's historic Dong Khoi Street, and stop to explore the War Remnants Museum. Wind your way through the canals of the Mekong Delta and visit local orchards. Fly north to Hue, the former imperial capital and a window into Vietnam's complex past. Delve into the ancient Citadel, an elaborate emperor's tomb and the tranquil Thien Mu Pagoda. At the Spiral Foundation, meet workers from the Deaf community as they guide you to make your own souvenir. Witness the lovely countryside and spectacular coastal scenery on your way to Hoi An. A living monument to Vietnam's rich history, this charming town boasts traditional houses and temples and the iconic Japanese Bridge. Enjoy some free time in Hoi An for shopping and further exploration. Fly from Danang to Haiphong. Relax as you watch farmers working their land on the drive to enchanting Halong Bay for an overnight cruise. Enjoy the freshest seafood while you cruise amongst the thousands of limestone islands. Continue on to Hanoi, and enjoy a delightful water puppet performance. Visit the ancient Temple of Literature and 'Hanoi Hilton' prison before a group farewell dinner with a local family in Hanoi. On your last day, enjoy free time until your departure transfer. End tour! The tour was an amazing experience with perfect included activities in each destination and a range of add on activities to suit everyones interests. It felt like we saw the best of both Cambodia and Vietnam and now know which places to go back to and spend more time. Our guide really made the whole experience special, he was a fantastic guide with a huge range of knowledge, he was friendly and approcable and alot of fun. The group ended the tour as sunshine family. If you never try you never know! This tour was one of the best experiences of my life and unique to any other travel I have previously done. It was such a great way to see so much and experience the best of Cambodia and Vietnam in such a short period of time. The tour was made so special thanks to our amazing guide. With a constant smile on his face and positive attitude we were able to always go with the flow and make the most of every experience. From the start of the tour to the very end he went out of his was to go above and beyond to ensure everyone was having a great time and felt included and involved. His experience and knowledge enabled me to learn a lot during every adventure whilst having a great time. Adorable Awesome tour! Very informative and helpful guide! Always there to answer all our questions and show us the best places in every city!! I will have second visit to this agency Fantastic tour guide, very warm,friendly and helpful. Knowledgeable about the areas we travelled to and organised. Loved the experience and would recommend to anyone :)!